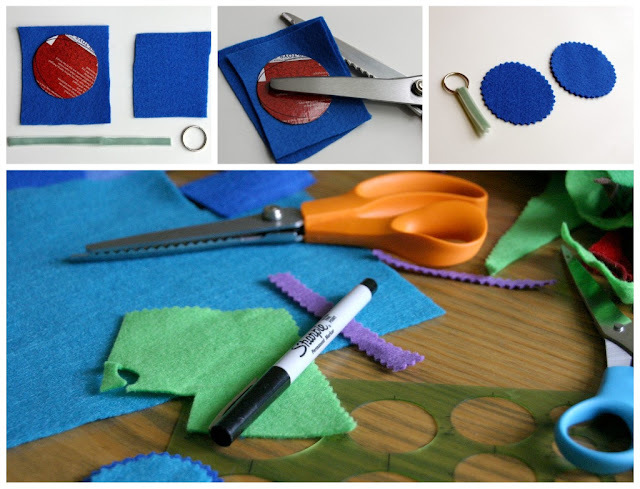 Do you have a whole box of felt scraps?… Oh that’s just me? I can’t let go of them for some reason even though an entire sheet is .25 cents. Well, I found a way to use all of those precious scraps. All you need is a keyring from the Hardware Store or Walmart. Use pinking shears (p.s. love my pinking shears) and cut two pieces for the front and back. I used a piece of cardboard as a template and a scrap piece of ribbon to attach the fab to the ring. Cut out three layers; each a little smaller than the last. I started by making perfect circles then I tried to go for a more abstract/messy look. Do you use your button foot as much as I do? I can’t live without it. I mean, call me a lazy sewer but it sews a button on in literally about 4 seconds. Continue sewing the other layers on in reverse order. 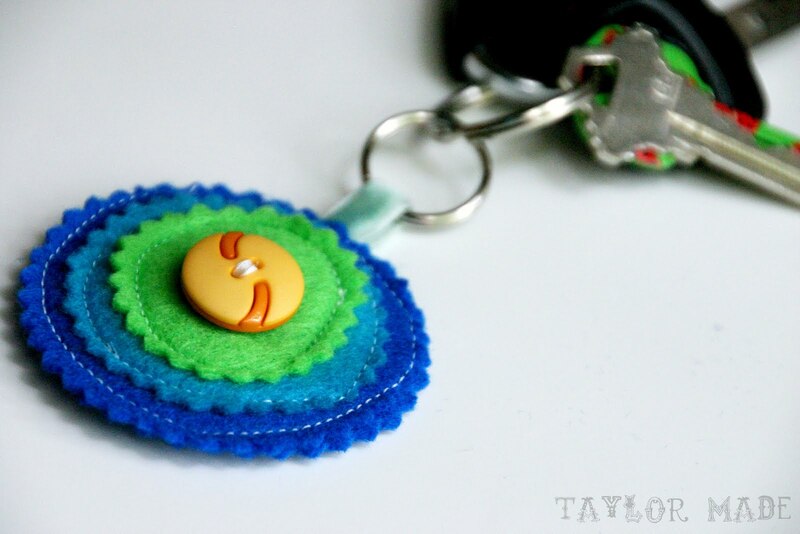 Sandwich the ribbon (with the key ring on it) between your two layers of felt. Do you see how I tried to make it look “messy” but I didn’t follow through… might be a minor craft fail? No, not for me, I slapped this baby on my key ring! Taylor! these are super cute…I love your blog design…beautiful. Thanks again for checkin’ out my yardstick crates & for the feature! Oh how cool! I have many felt scraps too! And I’m lovin your blog glad I ran into it! Neat way to use up those scraps. I have to hand sew my buttons, but after sewing 100 buttons in the shape of 100 for my Grandson’s 100th day of school…I will never complain about one or two. Taylor, you are so inspiring! My SIL Brittney (one of your friends) turned me on to your blog. So glad she did. I just saw this posting on Made by Joel (he just posted it today) and totally thought of your keychain project. Another way to repurpose felt scraps! cool idea for scraps for sure! !